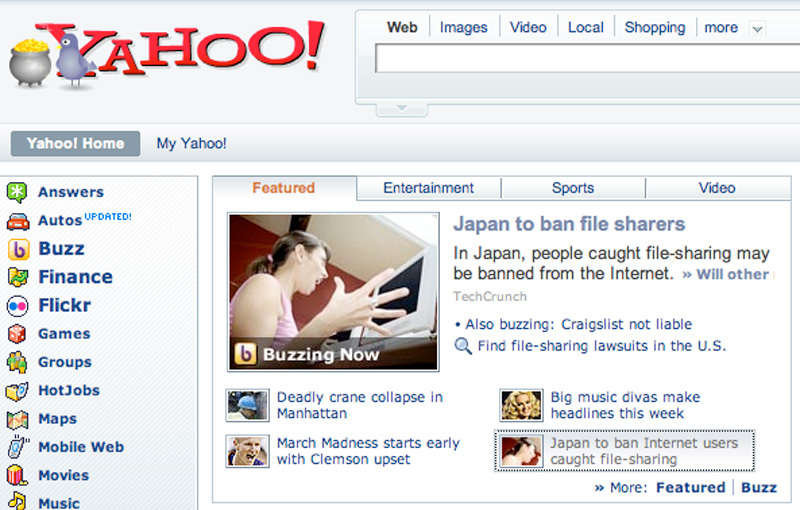 Yahoo Buzz, a Digg-like service that launched on February 25, is now nearly three weeks old. We asked Yahoo to share some of the data from those first two weeks. Salon got so excited about a February 28 link from the Yahoo home page to this story that they issued a press release – they had 1 million unique visitors that day, the most ever to the 12 year old site. US Magazine was linked from Yahoo on February 27, and had the second highest traffic day ever. 32% of visits that day came from the Yahoo home page. Smoking Gun, Portfolio.com, Dallas Morning News and Imaginova all reported significant traffic increases after links from the Yahoo home page. Yesterday we were linked from the Yahoo home page as well, for this story by Duncan Riley on Japanese ISPs blocking file sharers (see image above, click for larger view of how the links look). The link went live at 5:45 PM PST as one of the bottom four links in the news box (these send less traffic) and was up through the day. Despite the fact that yesterday was a Saturday (slowest traffic day of the week) and that it was up only 1/4 of the day, we had our highest traffic day ever and over 1,000 comments were left on the post. The traffic almost brought our site down, but the guys at Media Temple kept it alive. Yahoo is still ramping up the number of links it puts on the home page from Buzz, and is being careful about the potential to flat out nuke websites with all the traffic they can send. But it’s clear that a link from Yahoo.com blows away anything Digg or any other competitor can offer. That will keep the Buzz publishers, who must be invited into the service, paying attention.